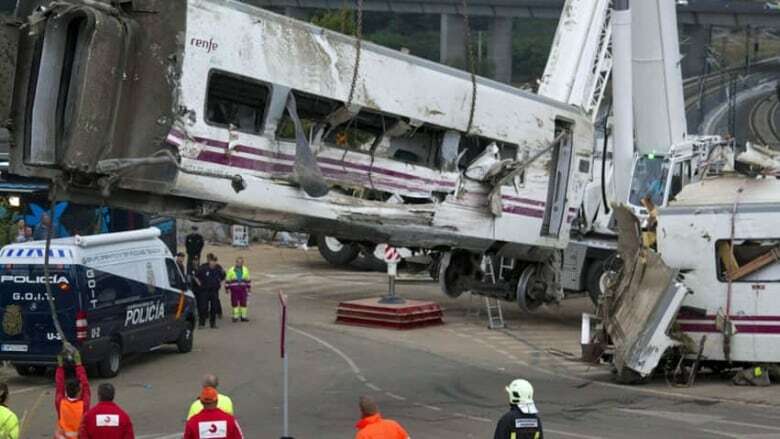 Dozens of people were killed and many more injured after a passenger train derailed in northwestern Spain. Here are some recent deadly train accidents in Europe. Dozens of people are dead following a train derailment in northwestern Spain on Wednesday night. Here are some recent deadly train accidents in Europe. July 12, 2013: Six people are killed and nearly 200 injured just south of Paris when four cars slide off the tracks as a passenger train speeds through the small French town of Bretigny-sur-Orge. April 22, 2012: A woman dies of injuries a day after two trains collide head-on in Amsterdam. At least 16 people are seriously injured. April 13, 2012: Three people are killed and 13 injured in a train crash near Frankfurt when two trains collide and derail. March 3, 2012: Two trains collide head-on in southern Poland, killing at least eight people and injuring around 50. Jan. 30, 2011: A head-on collision between a cargo train and a passenger train kills at least 10 people and injures 23 near the eastern German village of Hordorf. Dec. 9, 2010: One person is killed and two others are injured after a train derailed in southern Greece between the cities of Argos and Tripoli. Aug. 6, 2010: A train derails in southern Italy, killing one passenger and leaving about 30 injured on the outskirts of Naples, its destination. July 23, 2010: Switzerland's popular Glacier Express tourist train derails in the Alps, killing one person and injuring 42 on its journey between Zermatt and St. Moritz. Feb. 15, 2010: A train wreck in Buizingen, Belgium, kills 18 people and injures 55. July 1, 2009: Thirty-two people are killed and 26 injured when a train carrying liquefied gas derails and explodes while travelling through a downtown neighbourhood in the Tuscan seaside town of Viareggio. Oct. 6, 2008: A local passenger train runs into the back of a long-distance train near Budapest, Hungary, killing four people and injuring 26. Jan. 27, 2008: A passenger train derails in central Turkey, killing at least nine people and injuring dozens of others, possibly due to ice on the tracks. July 3, 2006: A local passenger train crashes in the southern city of Valencia, killing 43 people. Excessive speed is blamed.